A while back, we reviewed three systems for managing multiple WordPress sites – InfiniteWP, ManageWP, and WPRemote. These management platforms include features such as plugin upgrades, spam comment removal, backups, and more. In the end, we decided on InfiniteWP and were pretty happy with it for a while – really friendly support, new and useful features, constantly improving, etc. 1. Some of our hosting clients couldn’t upload images to their site because their disk space was full. I logged into one of our client’s cPanel to see what was taking up the most amount of space, but it’s hard to extract that data easily. I would later find out that IWP itself was the culprit. 2. Backups weren’t working for various reasons including 401 errors, timeouts, IWP Plugin connection error, and more. As we soon discovered, these two issues were linked. The problem: When an IWP backup didn’t work, it stored the half-baked backup in the /temp folder. As the failed backups started to grow in the /temp folder, it started using up more and more disk space on the server, resulting in our clients not being able to upload images to their site. We contacted IWP about the temporary files issue and they said they are working on it. But in the meantime, we needed an alternative solution. Discovering the problem: We may not have discovered the problematic /temp folder if it weren’t for (drumroll, please)… blogVault, an online backup service. After we realized backups weren’t working, we decided to try out blogVault (aff). blogVault offers real-time backups, meaning it only backs up the incremental changes on your site. And the backups are super fast! No crashing half-way through, no errors, no monkey business, just backups that actually work. Another good thing about the blogVault plugin is that it works with the “Network Activate” functionality in WordPress Multisite. Other plugins, like the IWP plugin, needs to be activated on a per-site basis within Multisite, which gets annoying when you have lots of sub-sites. One of the most jaw-dropping features in blogVault is the ability to test out a backup before restoring it. Backups are like black boxes – who knows what’s exactly in each one. With this feature, blogVault basically sets up a test site for you to view and review, and once you’ve confirmed it’s what you need, you can restore it one click. Wowsers. I also love that blogVault shows you which files are NOT being backed up because they’re superfluous. In other words, it’s the holy grail of finding out which files are unnecessarily clogging up your server! Look how much room we can free up! debug.log – this comes from having wp_debug set to TRUE in your wp-config file. error.log – these are helpful in case you ever get a white screen of death, but can also reach massive sizes, like 2GB! The plugin that connects a site to blogVault has not really been working for me so I need to add it manually to each site. I wish there was a better dashboard for seeing all the sites I’m backing up. Right now, you can either search or scroll, scroll, scroll to see more. I actually love the way IWP displays the list of sites you are managing. blogVault saves all your backups on their server. I would love to be able to save backups automatically to our own remote server. Right now, only Dropbox is available for these extra backups, and these backups can only be done manually one site at a time. Also, I wish I could select which folder I want the backup to go to in Dropbox. Currently, blogVault decides that it goes into a generic blogVault folder. It would be really cool if the skipped files list showed the size of each of the files individually. 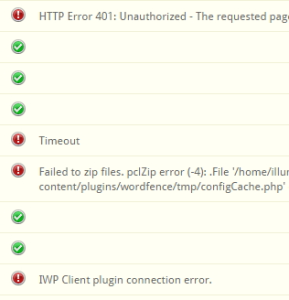 Don’t know if it’s possible, but would be cool if they had a way to delete error logs and other skipped files directly from the blogVault dashboard. I prefer to do backups at the server level rather than via a plugin. That way even if WordPress fails, the server will still be basing thingsup. Plus, the CLI is generally much better at handling large tasks like zipping uploads folders etc. Great post Rebecca. You articulated very clearly the problem with current WordPress management services and backup plugins. I am happy to announce that by the end of February ManageWP will have BlogVault level of robustness built into our product. Will be happy to have you give it a try.